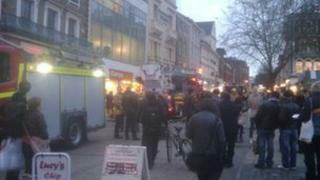 Part of Norwich market was cordoned off when three fire crews were called to rescue a gull caught in a tree. At least 15 firefighters were involved in helping the bird, which had become entangled in branches on Gentleman's Walk. The incident at 15:10 GMT attracted dozens of onlookers, many of whom said they were amazed at the number of firefighters and engines. The fire service said it was called by the RSPCA as the bird was in distress. One engine was called initially, but crews requested an aerial ladder platform, which requires a support vehicle, it added. The rescue took about 15 minutes once the aerial ladder platform arrived, and was over by about 15:45 GMT. The fire service, which estimates that fire engines cost £300 an hour when on a call, said it only responds to animal rescues if the RSPCA has already carried out an assessment. Crews can be called away from rescues if they are required at a more pressing emergency, a spokesman added. The bird was left in the care of the RSPCA.